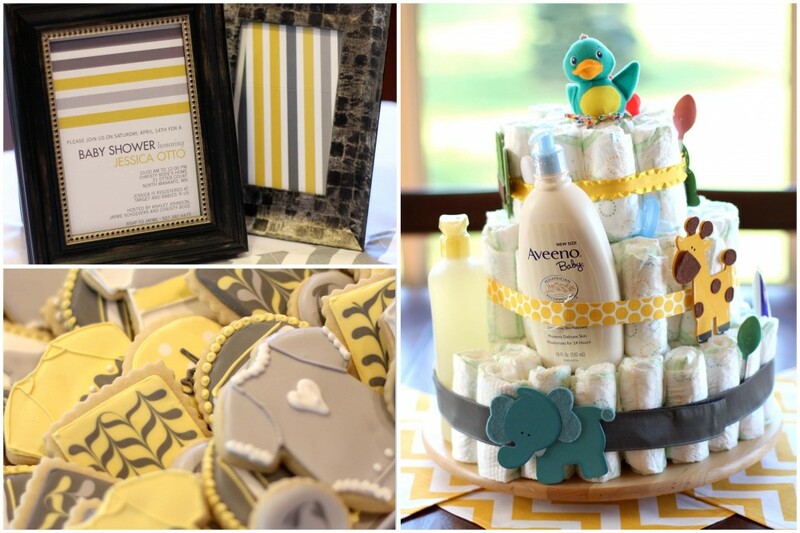 Recently I had the opportunity to help plan and host a baby shower for my good friend, Jess. 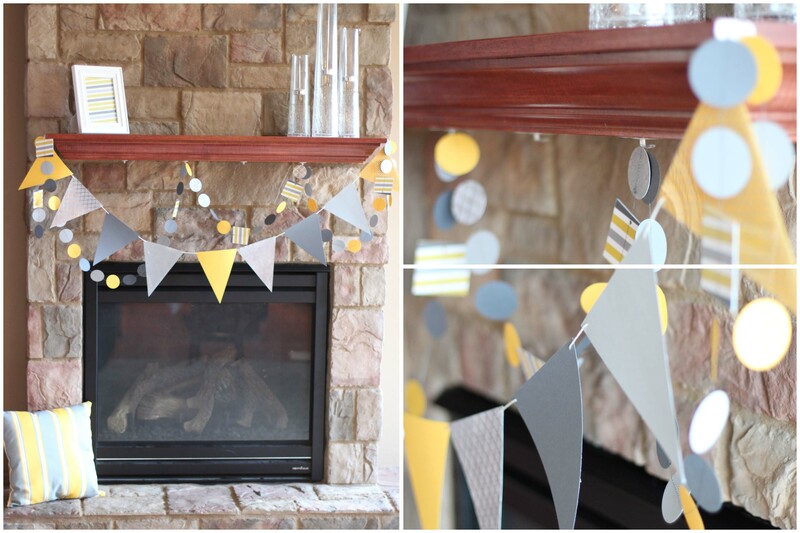 The two other hostesses and I decided to follow the theme of her nursery, yellow and gray, and do everything we could to make her shower extra special. We had fun baby shower ideas and I’ll start with my favorite things. 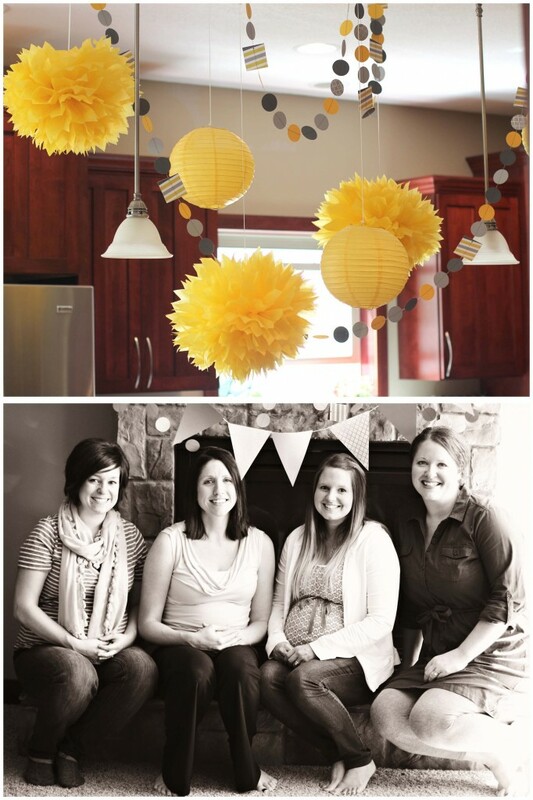 We hung paper lanterns, poms and garland above the kitchen island and we loved how it turned out! It really was the focal point of the shower. My other favorite part was the wonderful women I hosted the shower with, and the guest of honor herself! We went a little non-traditional on the invitation and used our I Do Stripes – Striped Wedding Invitations. This invitation is fun to create because you can pick all of the stripe colors to match your occasion, which made it easy to customize it to our yellow and gray theme. And what baby shower would be complete without a diaper cake? So easy to make, and what a great centerpiece! We added a few more touches of décor here and there. I made this little bunting banner out of paper card stock and sewed (yes, sewed!) paper garland to go along with it. I used my favorite sauce bottles from Specialty Bottles for our mimosas. 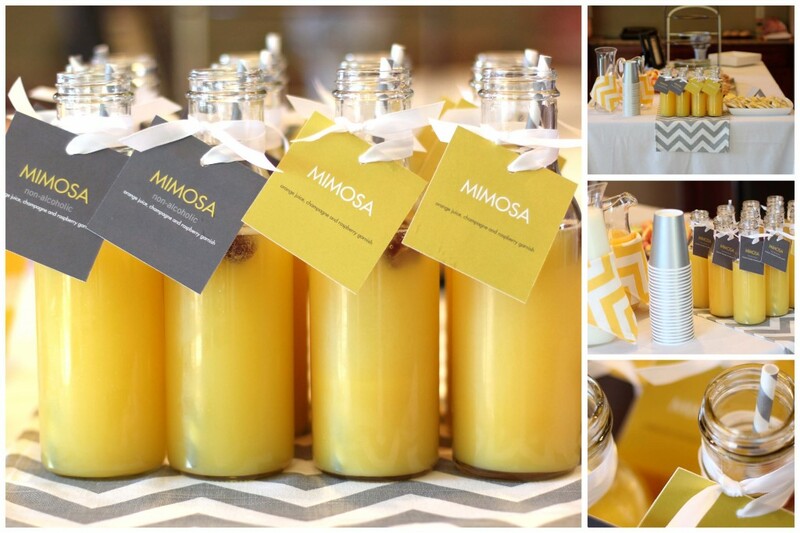 Using the invitation’s coordinating I Do Stripes – Wedding Favor Tags, we labeled the drinks to identify the ones that were safe for the pregnant mamas (which was incredibly important considering half of our guests, including the two other hosts of the shower, were expecting)! To really let the colors of the shower shine through, I covered my kitchen island with a solid white tablecloth and then purchased a gray chevron table runner and yellow chevron napkins from Bateson’s Boutique etsy store. 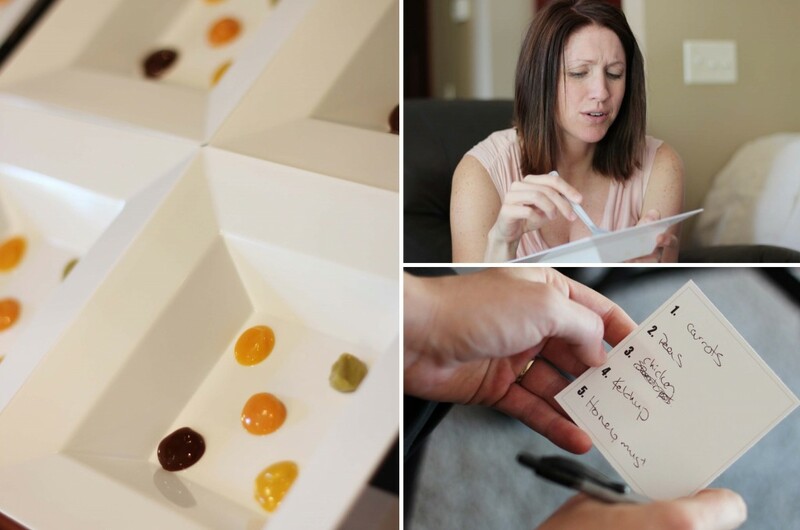 One of the games we played was to taste test baby food and guess the flavor. The guest of honor didn’t do so hot…considering ketchup and honey mustard were not correct 🙂 We’re confident she’ll quickly pick up on these! Our last touch was to bring the décor from the shower into Jess’ nursery! 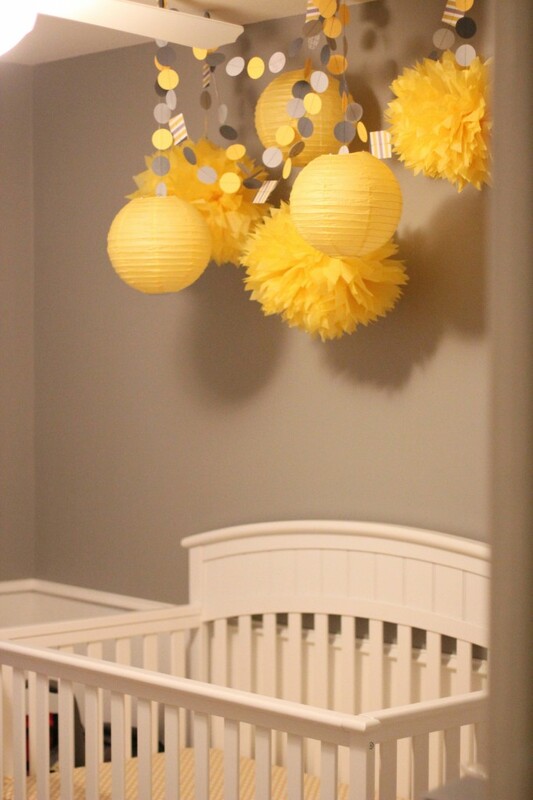 The poms and garland look perfect above the baby’s crib. There are so many baby shower ideas to choose from, having a theme or color scheme to narrow your search definitely helps! We are so excited for Jess and her husband to welcome their new baby in a little over a month! ← PreviousTeachers, win $100 for your classroom! Where did you get the poms and paper lanterns? I love this idea! Hi! We purchased the lanterns and poms from Party City, but they’re sold in many other retailers as well as the tissue paper poms are pretty easy to DIY! Thanks! Where did you purchase the garland or did you make that yourself? Hi Jennifer! I made the garland. The small garland was made up of circles punched out of scrapbook paper and then I sewed them together (very easy! ), the triangle banners were also cut out of scrapbook paper and then strung on string. Let us know if you have any other questions! Do you have a tutorial for the paper garland you sewed? Do you know what color paint is on the nursery wall? Awesome ideas! I know what to do with the baby shower that I will be throwing for my sister. Thanks for this! How many oz were the sauce bottle? Claudine, either the 10 oz. or 12 oz. size will work just fine. I believe these were 10 oz.